A day before the 7th edition of the PHP Unconference Hamburg the caretake of the venue called the organizers to inform them that their event cannot take place. The space would be needed as a polling station for the german federal elections… Eventually, the polling station was moved to the 7th floor and, well, business as usual: 330+ visitors, ~70 session proposals, 32 high quality sessions run, especially my own on MySQL 5.7 with built-in sharding ;-), ~40 Euros entry fee for what costs 400+ Euros elsewhere! 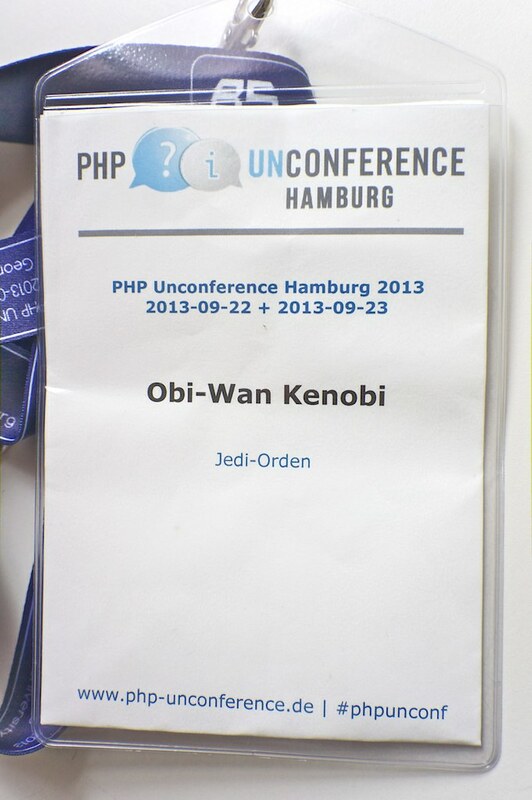 I am a huge fan of the PHP Unconference. Ever since the first edition the who-is-who of the national PHP community gathers at this family stlyle event. Very few events made it into this league from the start. Having a big name or being a sponsor, however, does not mean you make it on the session table as its the people that vote for sessions every morning. Only topics that really matter to the audience have a chance to make it. 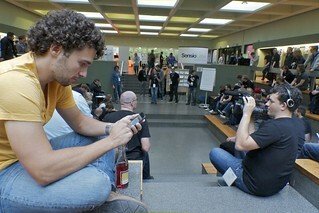 You can find photos of the session table at http://www.php-unconference.de/. There are long breaks between the sessions to force people to discuss and exchange ideas instead of hunting from one session to another session in a huge conference hotel. The building of the University of Hamburg, where the unconference takes place, is just about perfect for the event. There’s a “bath tub” where 200+ people can sit surrounded by six lecture auditoriums. The breaks are not the opportunity for discussions. When I came there on saturday, some looked amazingly tired and spoke about intensive discussions held in pubs at the Reeperbahn the night before. Well, I hope, they all have been fit enough to join the official, meanwhile traditional free drinks PHPProst event that took place on saturday evening. Did we all get a bit lazy? All in all the event does not need to hide. The unconferences continues to compare well with much more expensive business conferences and – due to the low ticket price – is very attractive to students. But over the years, some bad habits crept in as well. Tickets are rare and very hard to get. The event is usually sold out in days or even hours, because its such high quality. If you know you cannot make it, please give your ticket to someone else. I wish the organizers had a place for controlled ticket trading on the events web site. In the early years of the event it was common to run a feedback session at the end of the unconference. Everybody was asked to write down positive as well as negative impressions. Probably, many of you do retrospectives on a regular basis as you know the value of them. This year there was only one lonely “well done” or the like on the cupboard. With all the retrospectives experts around we should be able to do better. The sessions are hot. This year its been a very, very close race among the top proposals. You had to get like 30+ votes to make it (each participant has four votes per day). I missed some fun sessions. Sure, with all the experts being around to present the cutting edge topcis and all the presentations suggested on stuff that matters to solve pressing day to day problems, its hard to get through with fun sessions or excotic topics. Having Thomas talk about Arduino with PHP seemed the maximum possible. I wish there had been more. Unfortunately I have nobody but myself to blame. Unconferences are driven by their audience. Keep going there, keep the standards high for next years 8th edition. No such community event is possible without sponsors and organizers (BOOT – Best Of Open Technologies e.V.). Thanks, everybody! Thanks, Galileo computing: I won a book: “CouchDB – Das Praxisbuch für Entwickler und Administratoren“. Next time I meet Till in Berlin, I’ll ask him to sign it. The organizers are looking for helping hands to make the event happen again in 2014. If you like Open Source, you happen to be in Hamburg and you have some spare time, please, drop them an email: orga@php-unconference.de.